Strong 3.281 ft. Wide x 32.81 ft. Long Self Adhesive Hardwood Floor Install System covering 107.64 sq. ft.
Buy online Strong 3.281 ft. Wide x 32.81 ft. Long Self Adhesive Hardwood Floor Install System covering 107.64 sq. ft. Strong and leave review or share with Your friends. The Elastilon system installs three times faster than a traditional glue installation. Simply roll it out, install your favorite floor onto to it and you are ready to walk on it immediately. No subfloor required. No nails, no messy glues. Now you can use the Elastilon Self Adhesive Installation System to install any hardwood floor over any surface including directly over concrete. This revolutionary patented product will now allow you to install your hardwood anywhere, in practically any room. The easy 3-step peel and stick system saves you time and labor, compared with the complex and messy conventional installation of hardwood floors. 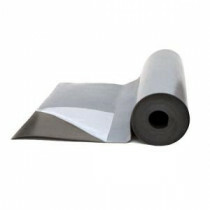 Elastilon eliminates gapping and cupping, increases cushion comfort, reduces sound transmission and so much more. One roll covers 107.64 sq. ft.